Spirit Guardian has been one of GTArcade’s most popular mobile games, with millions of downloads and players across Android and iOS. This month, the free to play action strategy RPG game turned one and to celebrate this special occasion, we have been giving back to the players that made the game such a success. We received so many warm-hearted congratulations from our fans from all over the world in the past two weeks. Now that the anniversary celebrations have concluded, we want to summarize what has been going on during the past two weeks. 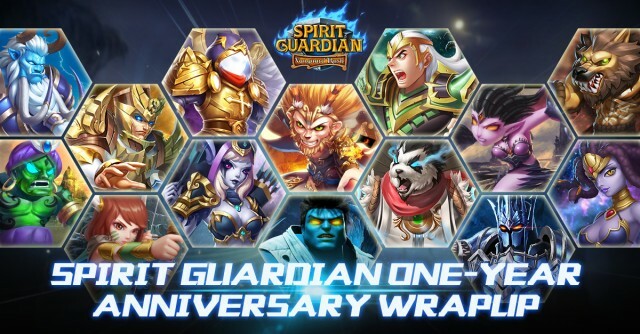 The entire team was very excited for the first anniversary of Spirit Guardian. In order to share our excitement with the fans, the team introduced the biggest update yet, Version 2.3; a massive content update including the Starlight System, Guardian System, Treasure Raid and so much more. The one-year anniversary brought a cheery and delightful atmosphere throughout the game and on all of our social media platforms. Of course an anniversary means gifts for everyone! The team prepared three rounds of gift codes that awarded tons of free stuff. We also offered our most popular event, the Double Event, for an entire week. Meanwhile other fan-favorites like Treasure Trove, Dream Wheel, and Tower of Babel were also brought back to carry on the festivities. During this one-year anniversary celebration, we received more than we expected. We want to thank all the brave adventurers in Dreamland who shared their own experiences during the past year with Spirit Guardian. The whole team was very moved by the touching and encouraging stories from our players. Through the game, some have found their soul mates, life-long friends, and comrades in battle. All your wonderful stories have inspired us and Spirit Guardian for the future. We were also happy to receive so much game feedback and suggestions from players that have helped make Spirit Guardian an even better game. Thank you all and Happy One-Year Anniversary to Spirit Guardian!